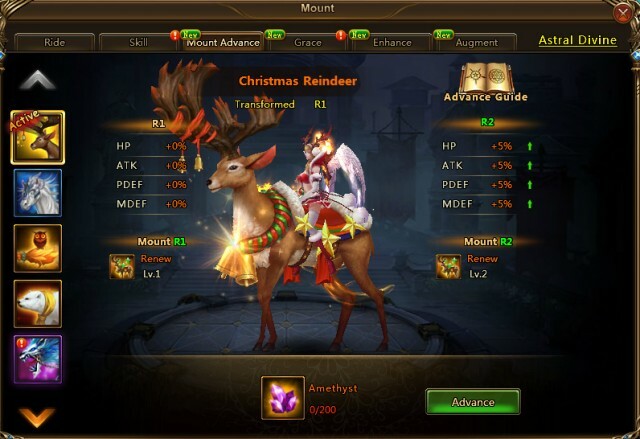 Christmas Reindeer Arrives in League of Angels II with a Sled of Gifts! The Christmas Tree has just been put up on Sapphire to let everyone know that Christmas is just around the corner! Santa has sent his Christmas Reindeer to League of Angels II with a sled full of gifts for brave warriors! Have you been naughty or nice? [Frost Armor] (Lv. 1): Increase Damage Reduction by (12%) for the first 2 rounds of battle. [Renew] (Lv. 1): Restore (2.8%) max HP each round for the first 3 rounds of battle. Have you experienced the new Armament system yet? If so, you probably already know how effective Grace skills can be in battles! Add the Christmas Reindeer to your Mount collection and unlock a life-saving healing skill for your squad! The Christmas Reindeer will appear in the new Tycoon event from Dec. 17 to Dec. 22! Once you reach the required amount of points, you will be able to take home your very own Christmas Reindeer! Join LoA2 this holiday season and celebrate Christmas with the Angels!